Evolution is driven by competition, as organisms fight for available resources. In particularly competitive situations, this can lead to evolutionary arms races, with competitors developing ever-more-powerful weapons to gain an advantage. This is particularly apparent in bacteria, which build a bewildering variety of toxic peptides and proteins to deploy against their neighbors. A new class of bacterial toxins, termed CDI for contact-dependent growth inhibition, was discovered a decade ago. As the name implies, these toxins require close proximity with their targets, and the system includes several proteins that work together to kill competitors on contact. One component forms a gateway in the membrane of the attacking cell, which is essential for the display of the toxic component on the cell surface. The toxic component is a large protein with a very long connector and a toxin domain. The connector includes a segment that binds to receptors on the target cell, where the toxin domain is cleaved, forces its way inside the cell, and wreaks havoc. PSI researchers at UC4CDI have recently solved the structures of the toxin domains of CDI proteins from several different types of bacteria. As discovered by these researchers, the toxins chop up nucleic acids in the target, but the targets are quite different in each: one breaks a key bond in a transfer RNA, one targets ribosomal RNA, and one is a nonspecific nuclease that, with the help of a zinc ion, avidly destroys all the DNA in sight. The one shown here is from the bacterium Enterobacter cloacae, from PDB entry 4ntq. The structure includes the toxic domain of the protein, shown here in pink, with several active site amino acids shown with ball-and-stick representation. Once inside cells, this protein will make a specific cut in ribosomal RNA, ultimately shutting down protein synthesis and killing the cell. The protein bound to the toxin, shown here in blue, is an inhibitor made by the attacking bacterium for self-protection. These bacteria must have a way to protect themselves from collateral damage by their own weapons, so they each build a specific inhibitor protein that blocks the toxin until it is deployed against their enemies. Two examples from different bacteria are shown here, from PDB entries 4g6u and 4g6v, with the toxin in pink and the inhibitor in blue. These two inhibitors use entirely different modes of action to block the toxin: the one on the right binds squarely in the middle of the active site, but the one on the left binds on the side of the toxin. These different modes make sense, though: each bacterium needs to have its own secret method of inhibition, otherwise their target bacteria would be able to use their own inhibitors for protection. 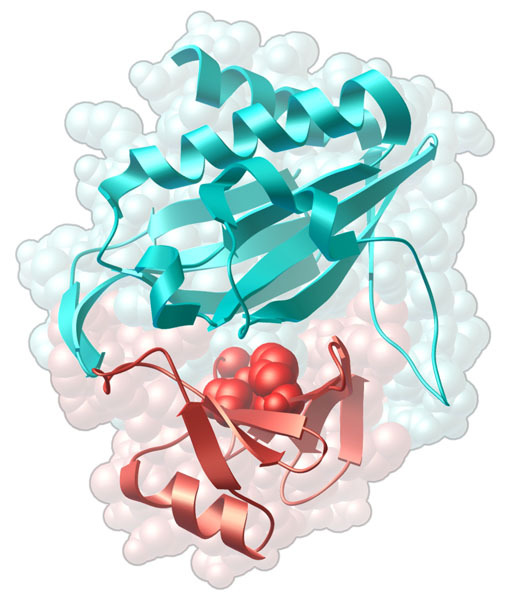 The CDI toxin from Escherichia coli (PDB entry 4g6u) is inhibited in an interesting way: the inhibitor grips a hairpin loop (shown in red) out of the toxin. The way this blocks the nuclease action of the toxin is still a matter of conjecture, since it leaves the active site totally exposed. It may block the approach of the target DNA, or it may distort the toxin in a way that inactivates it. 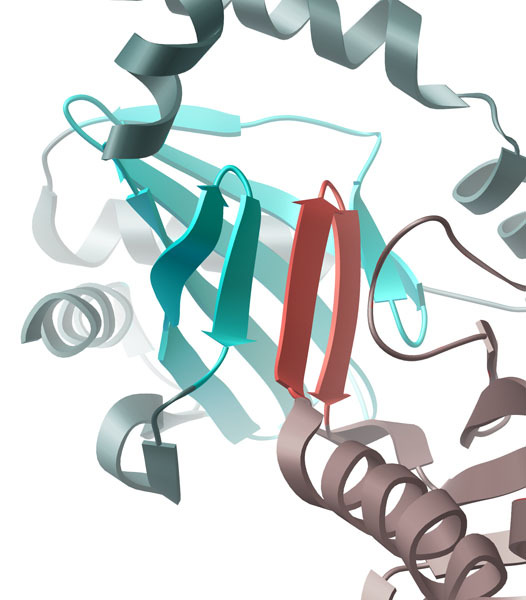 The hairpin loop binds in a form-fitting slot in the inhibitor, completing a ring of beta sheets that together form a beta barrel (shown in turquoise). To look at this interaction more closely, the JSmol tab below displays an interactive JSmol. The inhibitor of the CdiA toxin of Escherichia coli traps a beta hairpin from toxin inside a stable beta barrel. 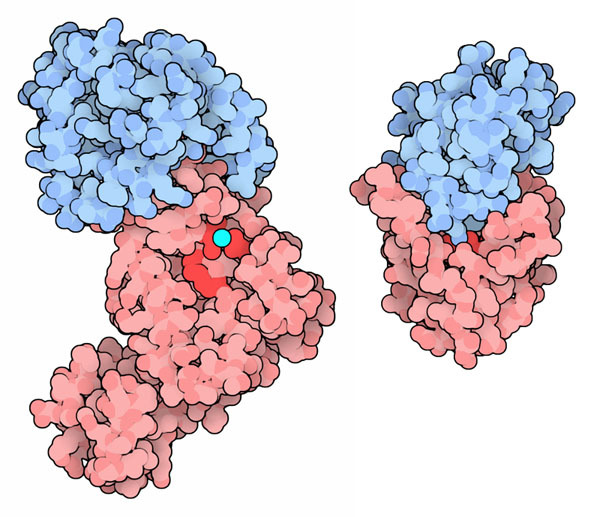 In this JSMol, the toxin is shown in red with the beta hairpin in brighter red and the active site amino acids in pink, and the inhibitor protein is in blue with the beta barrel in brighter turquoise. Use the buttons to take a closer look and to change the representation. Beck, C. M. et al. CdiA from Enterobacter cloacae delivers a toxic ribosomal RNase into target bacteria. Structure 22, 1-22 (2014). Morse, R. P. et al. Structural basis of toxicity and immunity in contact-dependent growth inhibition (CDI) systems. PNAS 109, 21480-21485 (2012).